EWG scientists reviewed Olay Total Effects 7 in One CC Tone Correcting Moisturizer, Fair to Light, SPF 15 (2014 Formulation) for safety according to the methodology outlined in our Skin Deep Cosmetics Database. We assess the ingredients listed on the labels of personal care products based on data in toxicity and regulatory databases, government and health agency assessments and the open scientific literature. 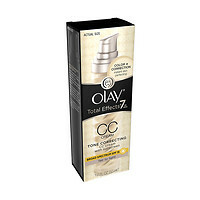 EWG's rating for Olay Total Effects 7 in One CC Tone Correcting Moisturizer, Fair to Light, SPF 15 (2014 Formulation) is 4. WarningsFor external use only. Do not use on damaged or broken skin. When using this product keep out of eyes. Rinse with water to remove. Stop use and ask a doctor if rash occurs. Keep out of reach of children. If product is swallowed, get medical help or contact a Poison Control Center right away.